Under cloudy Norfolk skies, three time British Superbike champion Shane Byrne, dominated round 3 of the 2014 British Superbike Championship by taking the double victory at Snetterton, extending his lead in the championship standings and bagging 10 extra Showdown credits. Superbike race one followed an emotional (and LOUD) aerial and on-track tribute to Simon Andrews and Karl Harris, both loved far and wide on the British racing scene, in which fans were treated with fly pasts from a B-17 Flying Fortress bomber and a RAF Tornado GR4 while Harris’ 1999 European Superstock winning GR Motorsport Suzuki and Andrews’ 2014 RAF Reserves Lee Hardy Racing Honda circulated the Snetterton 300 circuit, ridden by Brent Gladwin and TT rider (and Andrews’ team mate) Conor Cummins respectively. Byrne flew off the line as the lights went out in race one, took the holeshot and race lead for the opening three laps due to a safety car situation as a result of an incident involving Michael Rutter and Ben Wilson on the first lap. 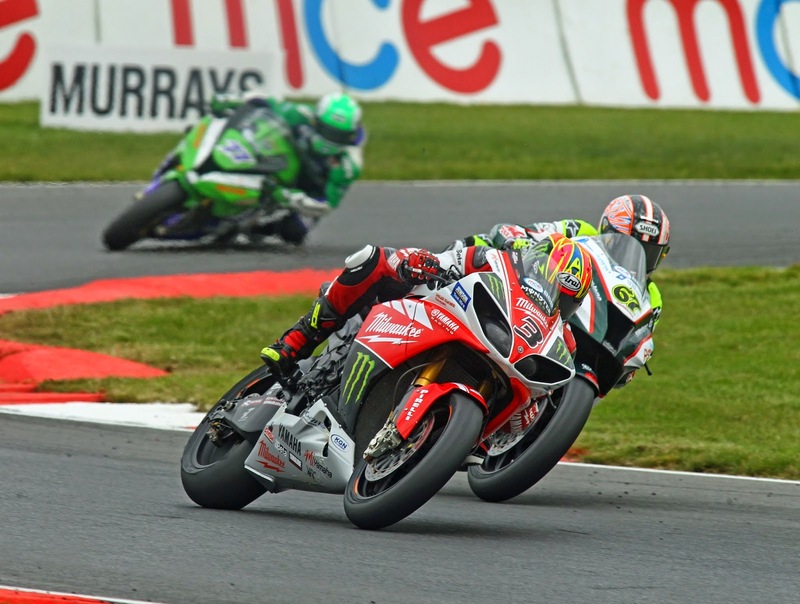 The Rapid Solicitors Kawasaki was tailed until half race distance by championship rivals, Josh Brookes and James Ellison with Brookes’ Milwaukee Yamaha team mate, Tommy Bridewell hot on the tails of the leading trio. On the 9th lap of 16 however, a small scrap between Ellison and Brookes for second place allowed Byrne to gain half a second on the pair and escape their clutches to take the win, despite Brookes’ best efforts in breaking away from Ellison and closing in on Byrne at a scintillating pace in the final couple of laps. A mistake into Oggies on the final lap scuppered Brookes’ hopes of a victory. Bridewell finished behind 3rd placed Ellison in 4th, followed by Kiyonari, Walker, Linfoot, Muff, Hopkins and Waters rounding out the top 10. After strong performances on their respective machines in qualifying, Julian Da Costa and Jakub Smrz were unable to convert their earlier pace into results as Da Costa crashed and took Smrz with him at the Montreal hairpin on the first lap. Stuart Easton was forced out of the race also on the opening lap due to a detached water hose, while James Westmoreland also failed to finish due to a crash on lap 11. It was a slightly different story in race two as Brookes clinched the lead coming out of Montreal on the first lap, following a swift start. Bridewell, Kiyonari, Ellison and John Hopkins lapped closely behind. After out braking himself into Nelson’s, Brookes fell back into third behind team mate Bridewell, allowing Byrne into the lead. He reclaimed the second position slot on lap four under braking into Montreal, leaving Bridewell within striking distance of Kiyonari’s Buildbase BMW. Kiyonari himself came under fire from Ellison a couple of laps later, allowing the GB Moto rider through to chase down the leading trio once more. With six laps left on the board, it was a Kawasaki sandwich with a Milwaukee Yamaha filling leading the pack, albeit only for a few laps as Brookes suffered a large high side coming out of Montreal while right on the back of Byrne’s seat unit, the Australian was evidently winded but ok following the incident. The crash, like the scrap between Brookes and Ellison in race one, provided Byrne with the breathing space he needed to gap his pursuers and take the double victory. Ellison threw lunge after lunge at Bridewell in an attempt to break his straight 3rd place record so far in 2014 and take second position, despite a failed attempt into Agonstini’s, the Cumbrian clinched 2nd coming out of the final turn on the penultimate lap leaving Bridewell to claim his first podium of the season in third place. Kiyonari took fourth after battling throughout the 16 lap race with fellow ‘SBK Veterans’, wildcarding Julien Da Costa and Walker – with Da Costa finishing in 5th and Walker failing to finish due to a mechanical issue. Dan Linfoot finished 6th ahead of Hopkins, Smrz, Waters, Cooper, Burrell and Ian Hutchinson rounding out the top 12. A full list of results from race one can be found on the TSL Timing website here, and race two results, here. The 4th round of the 2014 British Superbike Championship from Knockhill in Fife will get underway in two weeks time on the 27th of June. Next Next post: Rossi: "I thought I could win"